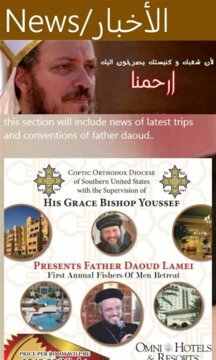 This Application has been approved and blessed by Father Daoud Lamie. THE APP IS LARGE IN SIZE BECAUSE IT CONTAINS ALL MP3 LECTURES DIRECTLY UPLOADED ONTO IT AND YOU DO NOT HAVE TO BROWSE THE MP3s OFF OF A YOUTUBE WEBSITE. YOU CAN USE IT WITH YOUR WIFI OR 4G NETWORK!!!!! The App was designed by a group of Father Daoud Lamei's Servants in order to spread god's holy word through Abona Daoud Lamei famous and holy words. 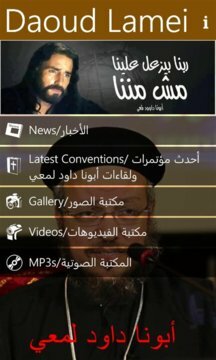 The app is composed mainly of all Father Daoud's lectures, famous sayings, and hymns in BOTH, VIDEO FORMAT AND MP3 FORMAT. The APP comes as a great tool for many Christians all over the world to listen and learn to the "Billy Graham" of the Coptic Church, as Father Daoud Lamei is considered as one of the greatest Evangelical Preachers in the HISTORY OF EGYPT.